I would advise that you buckle in before picking up The Guns Above. Quoting Josette Dupre, first female airship captain, “They say it’s not the fall that kills you." So true when you are in the middle of a war and on the new and untested Mistral airship, dodging bullets and bombs. Josette is also dodging Lord Bernat, whose secret assignment is to watch her closely and report back to command any time she shows weaknesses or indecision. After all, what does a woman know about war and battle strategy? 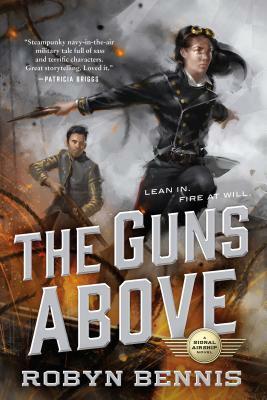 The Guns Above is a military tale with airship battles, spicy and snarky dialogue, adding a bit of a steampunk feel into the mix. Josette’s goal is to stay alive long enough to prove herself worthy of the role of captain. Bernat starts out as a fop who is clueless about naval warfare, and a bit (well, more than a bit) scared of the gunfire and bombs, who soon discovers the bravery hidden within his narcissistic demeanor. This debut will please those who enjoy military fantasy adventures such as those with Honor Harrington, as well as steampunk fans who enjoy a riveting description of airship manipulation and battle strategy. ROBYN BENNIS works in biotech but dreams of airships. She lives in Mountain View, CA, within sight of the historic Hangar One at Moffett Airfield. She is the author of the Signal Airship series, The Guns Above and By Fire Above.